Once Jessie and James have been defeated, you will finally be able to access the President's Office found on the eleventh floor of the Silph Co Building. Once inside, you will see Giovanni trying to force the Silph Co President into giving him the Master Ball. 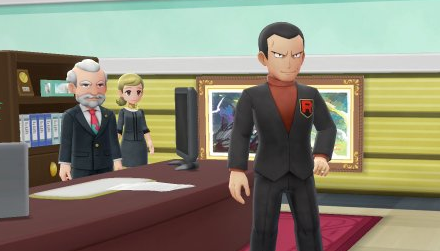 The President will remain steadfast in not helping Team Rocket, and as he does, Giovanni will eventually notice you. He will insist you not get involved in his plans, challenging you to a battle shortly after he does. Once defeated, Giovanni will relinquish Team Rocket's control over Silph Co; however, he will vow that Team Rocket will never stop and that all Pokemon exist to serve their purposes. The President of Silph Co will then thank you by giving you the Master Ball. Not sure when you should use your Master Ball? Check out our When To Use The Master Ball Page!